How do you synchronize your files between two computers? If you are still copying the whole folder from one PC to another, here is a useful administration tool which can help you to solve your tedious tasks. Named as FileMyster, it is a free administration tool that allows automatic or manual synchronization between two folders or two PC. It has been designed to support synchronization of music files, movies, documents and etc. Supports one way or two way synchronization. Have the exact same files with full mirror (source/destination) or half mirror(destination only). Allows the users to specify which file types to sync or not to sync. Able to schedule synchronizations by daily, weekly, monthly or user defined period. Automatically backups overwritten or deleted files when configured to do so. Fully detailed log after each synchronization. Configure each slot separately with unlimited number of slots. Auto-synchronization service integrated with Active Directory Accounts. 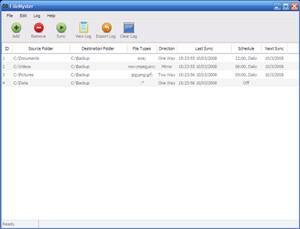 The FileMyster is able to run on Windows XP, Windows Server 2003, Windows Server 2008, Windows Vista, and Windows 7. It available in two version, and .